Sept 23, 2013 Update - Added to Definitions: S. 1392 (Shaheen D-NH/Portman R-OH) The Energy Savings and Industrial Competitiveness Act of 2013. This bill setting voluntary building codes, establishing industrial assistance program and ordering federal agencies to reduce their energy use was designed to be small, an effort to "put some points on the board," as Sen. Ron Wyden (D-Ore.) puts it-- and to demonstrate that the Senate could pass an energy bill for the first time since 2007. If it passed, supporters said, maybe that would herald hope for a new era of small-bore energy bills that could make it through a fractured Congress. However, it being held up by an unrelated amendment from Sen David Vitter (R-LA) to repeal Obamacare. Energy codes can vary greatly from state to state and even from edition to edition of codes developed by the same authority. Some of the codes in place are state developed, and take into account state-specific concerns such as climate, the state's economy and history, and impact on local building communities. Many other states adopt state-specific amendments to the national model codes. The codes are not a static document and, while national model codes are published every 3 years, they are almost constantly under revision to improve compliance, implementation, and enforcement for everyone involved in the building process. Energy codes generally provide two methods for compliance. The first, and most common method is referred to as the prescriptive approach. In this approach, a structure must be built to the prescribed insulation and other values found in the code. Trade-offs are allowed between certain building components that have different energy performances, giving an added degree of flexibility. The alternative method of compliance is the performance approach. Using this process, a structure is allocated an energy budget, or total allowable energy use, and can use a combination of different insulation values and equipment efficiencies in order to meet this budget. The overall energy performance of the structure, and not the individual components, is what matters. For example, a builder can use less insulation but a more efficient furnace to meet the allocated energy budget for the structure. Building a new power plant can cost over $2000 per each kilowatt it can produce. By comparison, each kilowatt saved by an investment in an energy-efficient building costs only about $300. Despite general agreement that energy efficient structures are a good thing, surprising obstacles remain. Building regulations in the US are localized in the US have created literally several thousand different code specifications which in essence fragment the construction market, contribute to manufacturing inefficiencies and increase costs. ACH - Air Changes per Hour - Amout of outside air infultration or leakage in a building. Measured by a Blower Door test for envelope tightness at 50 pascals or 0.20 inches. Minimum of 0.35 ACH is required for IAQ (Indoor Air Quality) 2008 Title 24 requires mechanical ventilation on new residential construction. ASHRAE - American Society of Heating and Refrigeration and Air Conditioning Engineers - The organization that creates standards for building engineers. 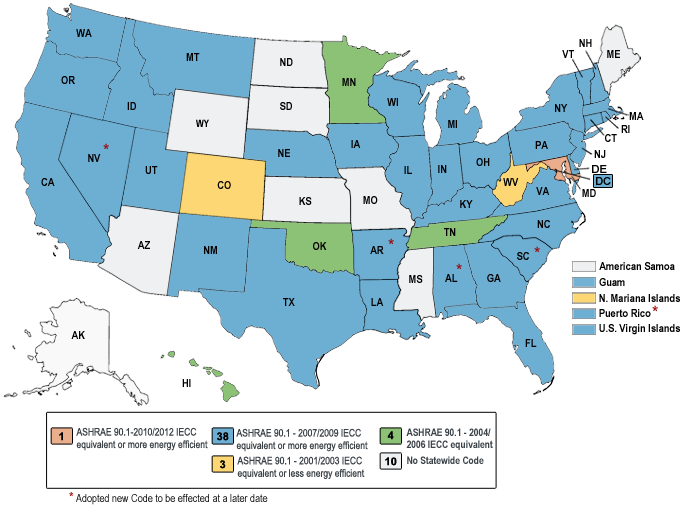 ASHRAE -IEC 90.1 Building Code - Many states use IEC 90.1 as a base for state specific amendments. Commercial building energy codes are based on ASHRAE/IESNA Standard 90.1, Energy Standard for Buildings, jointly developed by ASHRAE and the Illuminating Engineering Society (IES). ASHRAE Standard 90.1 applies to all buildings, except residential buildings less than three stories, and provides minimum requirements for the design of energy efficient buildings. Recent work from ASHRAE has resulted in a series of new efficiency standards and Advanced Energy Design Guidelines. CALRES 2008 - A revised public domain compliance software for the 2008 Residential Building Energy Efficiency Standards. CALRES 2008 is now available for demonstrating compliance with the 2008 Standards for one zone, newly constructed residential buildings. Carbon Neurality - (aka net zero carbon footprint)- Achieving net zero carbon emissions by balancing a measured amount of carbon released with an equivalent amount sequestered or offset.Has become a goal because it can be directly measured. vs. legal lot line. Compliance Options - There are several pathways to comply with Title24. Prescriptive Approach - Lists the minimum R-value or maximum U-factor requirements for each building component such as windows, walls, and roofs. This approach is quick and easy to use, but many users find it somewhat restrictive because the requirements typically are based on worst-case assumptions and all requirements must be met exactly as specified. The prescriptive approach allows quick review of the requirements. Trade-Off Approach - Allows you to trade enhanced energy efficiency in one component against decreased energy efficiency in another component. You can, for example, trade decreased wall efficiency (lower R-value) for increased window efficiency (lower U-factor), or increase the roof insulation and reduce or eliminate slab-edge insulation. Typically, this method is less restrictive than prescriptive approaches because components that exceed the requirements can compensate for those that do not meet the code. If these requirements are too restrictive, try a trade-off approach. For example, if the window area of the building exceeds that allowed by the prescriptive approach, a trade-off approach might work. Systems Performance Approach - Allows you to compare your proposed design to a baseline or reference design and demonstrate that the proposed design is at least as efficient as the baseline in terms of annual energy use. This approach allows greater flexibility but requires considerably more effort. A performance approach is often necessary to obtain credit for special features, such as passive solar design, photovoltaic cells, thermal energy storage, and fuel cells. This approach requires an annual energy analysis for the proposed design and the reference design. If nontraditional components are used or if energy use trade-off between building systems (e.g., envelope, mechanical) is desired, then use the performance approach. DEER - Database for Energy Efficient Resources. The DEER database has two pieces of information. It has measure costs but it also has estimated savings. We would not be using the estimated savings part of the database, just the, just the measure costs. This is a starting point. We expect that the HERS providers, and in fact it is the responsibility of the HERS providers, to periodically update this database on at least an annual basis. And they would do this by taking into account custom approach costs that are reported through their raters and other types of information. EPCA – Energy Policy and Conservation Act - Historically high oil prices and economic shocks that hit the United States prompted Congress to pass EPCA in 1975. One of the act's primary objectives was petroleum price regulation and allocation. In 1978, an amendment was passed requiring states receiving financial assistance from the federal government to initiate "mandatory programs and measures, including: energy conservation standards for new buildings". Energy Codes - A subset of building codes. Building codes are written legal requirements governing the design and construction of buildings. Most of the codes adopted by state and local governments set minimum standards for safe occupancy and to protect individuals from substandard living and working conditions. All building codes generally reflect a consensus of current design and construction practice. They are intended to lock in safe current practice as a minimum standard for design and construction of residential and commercial structures. Energy codes cover areas of construction such as wall and ceiling insulation, window and door specifications, Heating, Ventilation, and Air-Conditioning (HVAC) equipment efficiency, as well as lighting fixtures and controls. In some sense, energy codes are different compared to other building codes. They do not exist to protect the immediate health and safety of the building occupants in the same way as other codes. Implementing energy codes results in a reduced demand for energy. Energy Pro 5.0 - The latest version of Energy Pro, which has been updated to meet the ACM Manual requirements for compliance software for the 2008 Nonresidential Building Energy Efficiency Standards. The Energy Commission approved Energy Pro 5.0 on July 29, 2009. Energy Pro 5.0 is now available for demonstrating compliance with the 2008 Standards for nonresidential buildings, high-rise residential buildings and hotels and motels. 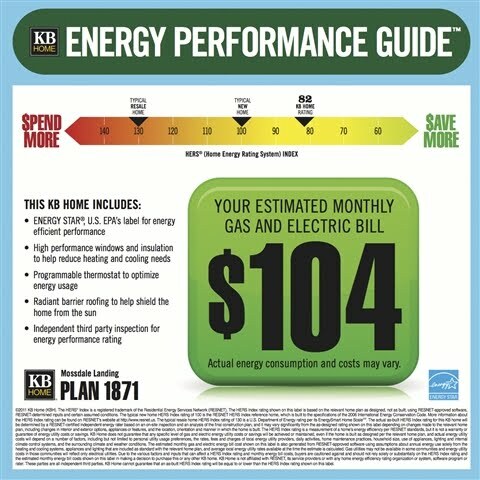 Energy Star Building Rating- The national energy performance rating is a type of external benchmark that helps energy managers assess how efficiently their buildings use energy, relative to similar buildings nationwide. The rating system’s 1–100 scale allows everyone to quickly understand how a building is performing — a rating of 50 indicates average energy performance, while a rating of 75 or better indicates top performance. Becuase rating is based on percentile, when a building scores close to the median, small EUI changes result in a big change in score. Energy Star is normalized for occupancy hours and building use. EPAct 1992 - Federal Energy Policy Act of 1992 - EPAct amended the EPCA, establishing a role for the DOE to determine whether or not the 1992 Council of American Building Officials (CABO) Model Energy Code (MEC) and the ASHRAE Standard 90.1-1989 would improve energy efficiency for residential and commercial buildings respectively. This also applied to subsequent revisions of those codes, and is the basis on which DOE is required to make a determination within 12 months of the revision of the respective energy codes. 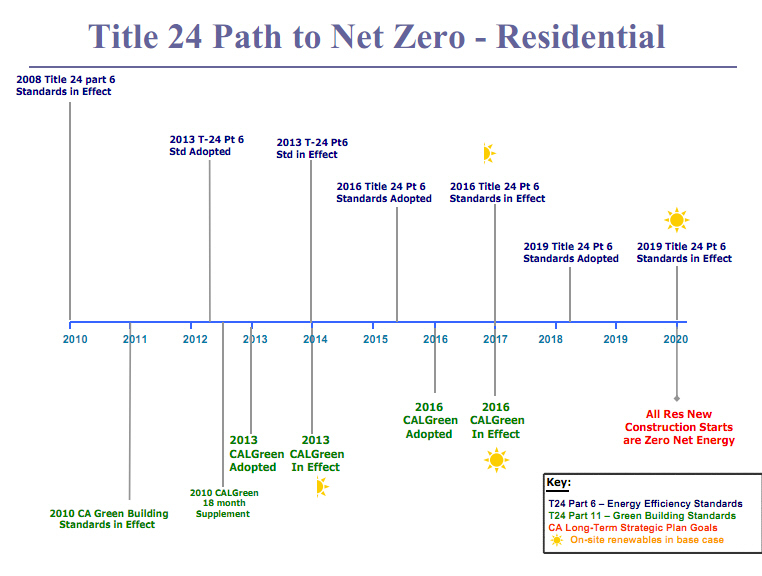 Once a positive determination is published in the Federal Register, each state has 2 years to certify that it has made revisions to its own energy code, so that it meets or exceeds the requirements of the latest iteration of the national models. A state may decline to adopt a residential energy code by submitting a statement to the Secretary of the DOE, detailing its reasons for doing so. The CABO MEC was last promulgated in 1995 and has since been replaced by the International Energy Conservation Code (IECC). EPACT 2005 - Federal Energy Policy Act of 2005. Tax deduction of $0.60 per sf for lighting systems that are 40% better than 90.1-2001 and have dual level switching. Executive Order 13514 - Federal Leadership in Environmental, Energy, and Economic Performance This Oct 5, 2009, executive order mandates that at least 15 percent of existing federal buildings and leases meet Energy Efficiency Guiding Principles by 2015, and that annual progress be made toward 100 percent conformance of all federal buildings, with a goal of 100% of all new federal buildings achieving zero-net-energy by 2030. The U.S. government is the largest consumer of energy in America. It has roughly 500,000 buildings, and most of these buildings are energy-inefficient. Fifteen percent of 500,000 buildings is 75,000 buildings. Green roofs are explicitly recommended for government buildings. Zero-net-energy goals are to be incorporated into the process of buying or leasing new government properties. As of 2020, all planning for new Federal buildings requires design specifications that achieve Zero-Net-Energy use by 2030. Large government buildings have to start showing progress by 2015. More specifically, at least 15 percent of any agency's existing buildings and building leases above 5,000 gross square feet must conform to Zero-Net-Energy by Fiscal Year 2015. Ongoing improvement is required. Historic buildings may be retrofit to comply with the order. The final rule also establishes a requirement for new Federal buildings to achieve a level of energy efficiency 30% greater than 90.1-2004 when life-cycle cost-effective. If the additional 30% savings is not life-cycle cost-effective, an agency must evaluate the cost-effectiveness of alternate designs at successive decrements below 30% (e.g., 25%, 20%, etc.) in order to identify the most life-cycle cost-effective design for that building. GreenTRIP - Rates how well a project encourages sustainable transportation options. Most green certification programs such as the U.S. Green Building Council’s LEED certification or the U.S. Environmental Protection Agency’s Energy Star rankings look at a building’s systems and materials while GreenTRIP focuses just on transportation. GreenTRIP provide a one-page scorecard that shows whether the developer is doing much more to ensure transportation for the life of a project and is sponsored by TransForm, a Bay Area group that advocates public transportation and walkable communities. Projects receive points for having features such as bike racks, proximity to bike lanes and public transportation and for providing transit passes and car-sharing access to residents for 40 years. Other programs, such as LEED, reward points for projects that provide car sharing and transit passes for three years. The new program also rewards developers who require buyers or renters to pay separately for a parking spot instead of including it in the purchase price of the unit or the rent. HERS Index - The index is the ratio of TDV energy of the rated house to the time-dependant valued energy of a reference house. 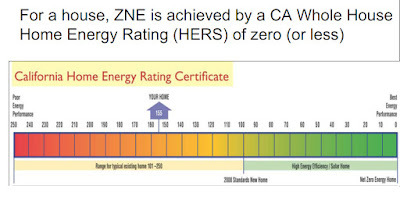 So on this scale zero would represent a net zero home. One hundred would represent, would indicate that your home is complying or uses the exact same energy as the reference home. IECC – International Energy Conservation Code – Energy code Introduced in 2000 as a streamlined code for both commercial and residential. Part of the family of International Codes developed by the International Code Council, a widely recognized building code development organization. The IECC is applicable to all residential and commercial buildings and provides the minimum energy efficiency provisions for residential and commercial buildings. The code contains building envelope requirements for thermal performance and air leakage while making allowances for different climate zones. Because it is written in mandatory, enforceable language, state and local jurisdictions can easily adopt the model as their energy code. IECC 2012 This package of code changes will achieve a 30 percent goal in the increase in energt savings in both residential and commercial buildings compared to its 2006 predecessor. The vote was part of the International Code Council's (ICC's) final action hearings, which were held October 27-31, 2010 in Charlotte, North Carolina. The genesis of the system was the Building Research Establishment's Environmental Assessment Method (BREEAM), In 1996, the Canadian Standards Association (CSA) published BREEAM Canada for Existing Buildings. The Green Globes system is used in Canada and the USA. In the USA, Green Globes is operated by the Green Building Initiative (GBI). In Canada, the version for existing buildings is operated by BOMA Canada under the brand name 'BOMA BESt'. The Green Globes system has also been used by the Continental Association for Building Automation (CABA) to power a building intelligence tool, called Building Intelligence Quotient ( BiQ). Green Globes is being supported as an alternative to LEED by trade industry associations due in large part to proposed LEED v4 integration of EU's REACH standards and credits for disclosure of chemicals in products and avoidance of chemicals of concern. LEED – Leadership in Energy Efficiency and Environmental Design - Product of US Green Building Council. Increasingly important on commercial and institutional projects. Points based system. LEED v4 - Launched in November, 2013. To help projects reach a higher standard of sustainability, LEED v4 also introduces new "impact categories," which are climate change, human health, water resources, biodiversity, green economy, community and natural resources. New building types include: data centers, warehouses and distribution centers, hospitality, existing schools, existing retail and mid-rise residential projects. LEED credit submittal requirements have been simplified, descriptive step-by-step reference guide materials with videos and tutorials, and a more intuitive technology platform have been added. Among the biggest changes are those in the Materials and Resources (MR) category. Even though this category carries relatively few points (about 10% of the total in most Building Design & Construction rating systems), it has the most direct impact on major building material markets with their associated economic and ecological impacts, so this category is a lightening rod for controversy. LEED v4 rewards both disclosure of chemicals in products and avoidance of chemicals of concern in its new credits. USGBC has stuck with its strong commitment to the Forest Stewardship Council as the minimum standard for wood product certification. It has, however, backed off in the May 2012 draft from a credit that included PVC—the plastic most widely used in buildings—among the substances to be avoided. That’s a function of a decision to reference the European REACH list for that credit. PVC remains among the substances that would have to be disclosed, based on the lists in Clean Production Action’s Green Screen Benchmark. LEED V4 introduces a more sophisticated approach to many of the materials credits, replacing simple proxies for environmental benefit, such as recycled content and rapidly renewable materials, with requirements that call for life-cycle assessment, disclosure of ingredients, and avoidance of problem chemicals. Offering credit in some cases for merely reporting on ingredients and LCA results, regardless of how good those results are. This approach amounts to a big vote for transparency and support for developing data sources and tools, in the hopes that future versions of LEED will be able to make use of widely available data to set rigorous thresholds. The USGBC responds that it is not a standard-setting organization; it gathers the best third-party standards in order to transform the market in the service of healthy and sustainable built environments. Unfortunately, on the subject of safer chemicals, there is no equivalent U.S. standard to REACH. While the methods are far from perfect, moving to include mining impacts in the mix, and introducing some filters to the old blanket endorsement of any rapidly renewable material, are clearly big steps forward. Similarly, in the arena of indoor pollutants from materials, USGBC has determined that the market is finally ready to move from documenting VOC content to measuring VOC emissions. A letter, dated May 18 and signed by 60 members of Congress, accuses USGBC of transforming LEED into a “tool to punish chemical companies and plastics makers” and says adding the REACH program to the LEED system would give U.S. manufacturers no voice in changes to the program’s requirements. The letter urges GSA’s administration to discontinue its use of the LEED rating system as a guide for construction or major renovations in federal buildings if USGBC does not reconsider “these harmful provisions in LEED 2012.” In comments submitted to USGBC, the American Coatings Association (ACA) said inserting the REACH program into the LEED rating system would present major compliance complications. Among other comments, ACA made the following observations. REACH is a complex chemical risk-management program that would present major compliance issues for U.S. building-materials suppliers and other parties with ties to building construction and renovation. Manufacturers currently face the task of complying with domestic regulatory requirements, and bringing the REACH program into the picture would add a whole new set of regulatory requirements. REACH presents a particularly difficult challenge for companies that do not currently export products to Europe and are not versed on the REACH program. This would disrupt the market and could severely limit the range of products that can be used while still meeting the LEED 2012 credit criteria. ACA also said USGBC has failed to give materials suppliers and other interested “stakeholders” adequate opportunity to participate in the credit-development process, with REACH added as criteria for credits only recently, at the time the fourth and final comment period was announced; the comment period began May 1. ACA urged USGBC to completely eliminate the credit category for avoidance of chemicals of concern, based on the reasons cited in the comments. The association also said proposed disclosure criteria for “chemicals of concern” would reveal proprietary information about products, a crucial issue for makers of formulated products that rely on technology advances to compete in the marketplace. ACA also called for revisions in several other parts of the LEED 2012 draft, including emissions testing for low-emitting interior products. Emissions testing as opposed to content requirements is not a practical or viable approach, and would adversely affect the availability of needed products that can comply with such testing, the association said. Enroll in minimum of one-year manual demand response program with an ISO, utility or curtailment service provider for 10 percent of estimated peak demand or a minimum of 20kW. If demand response isn’t available, you can simply put a plan in place to take advantage of it, or dynamic pricing plans, when it becomes available, although it is unclear whether this can score any actual credit. The second option is to have semi- or fully automated demand response for at least 10kW or 5 percent of peak electricity, although it still must meet a 10 percent load shed requirement overall. Semi-automated demand response -- which is defined by USGBC as a real person implementing an automated, pre-programmed DR plan (rather than someone shutting stuff off manually) -- was specified as being separate from a fully automated system. Perform 2008 - The revised public domain compliance software for the 2008 Nonresidential Building Energy Efficiency Standards. PERFORM 2008 is now available for demonstrating compliance with the 2008 Standards for nonresidential buildings, high-rise residential buildings and hotels and motels. QII - Quality Insulation Installation - Under Title24, a compliance credit is offered when QII procedures is followed for SPF application in low rise-residential buildings and verified by a qualified HERS rater. REACH - a European Union Regulation that addresses the production and use of chemical substances, and their potential impacts on both human health and the environment. It is the strictest law to date regulating chemical substances and will affect industries throughout the world. REACH entered into force in 1 June 2007, with a phased implementation over the next decade. When REACH is fully in force, it will require all companies manufacturing or importing chemical substances into the European Union in quantities of one tonne or more per year to register these substances with a new European Chemicals Agency (ECHA) in Helsinki, Finland. Since REACH applies to some substances that are contained in objects (articles in REACH terminology), any company importing goods into Europe could be affected. Reach Codes - Local ordinances (reach codes) prepare the market in advance of statewide standards. REScheck – DOE Residential Compliance Software Tool - The REScheck materials have been developed to simplify and clarify code compliance with the Model Energy Code (MEC), the International Energy Conservation Code (IECC), and a number of state codes. The REScheck residential compliance materials offer two ways to demonstrate compliance: the trade-off approach and the prescriptive packages approach. S. 1392 (Shaheen D-NH/Portman R-OH) The Energy Savings and Industrial Competitiveness Act of 2013. Reported by Committee May 08, 2013, has not passed Senate as of Mar 1, 2014. The chemical industry is lobbying vigorously under the guise of the “American High-Performance Building Coalition“ to insert an innocuous-sounding provision into the Senate’s Shaheen-Portman energy efficiency bill (S.761) that would prevent the U.S. government from using LEED. They are concerned about one or two points out of 100 that would reward the use of healthier building materials and have longer term fears about the precedent and what might become mandatory. This bill setting voluntary building codes, establishing industrial assistance program and ordering federal agencies to reduce their energy use was designed to be small, an effort to "put some points on the board," as Sen. Ron Wyden (D-Ore.) puts it-- and to demonstrate that the Senate could pass an energy bill for the first time since 2007. If it passed, supporters said, maybe that would herald hope for a new era of small-bore energy bills that could make it through a fractured Congress. However, it was held up by an unrelated amendment from Sen David Vitter (R-LA). to repeal Obamacare. Support full compliance with state and local codes. Directs the Secretary to provide grants to establish building training and assessment centers at institutions of higher learning to identify and promote opportunities, concepts, and technologies for expanding building energy and environmental performance. Requires the Secretary to make grants to eligible nonprofit partnerships to pay the federal share of career skills training programs to help students obtain a certification to install energy efficient buildings technologies. Reduce the amount authorized to be appropriated for the Zero Net Energy Commercial Buildings Initiative for FY2015-FY2018. Requires the Administrator of the Small Business Administration (SBA) to expedite consideration of applications from eligible small businesses for loans under the Small Business Act to implement recommendations of industrial research and assessment centers. As part of DOE's industrial efficiency programs, to carry out an industry-government partnership program to research, develop, and demonstrate new sustainable manufacturing and industrial technologies and processes that maximize the energy efficiency of industrial systems, reduce pollution, and conserve natural resources. Commercial or industrial machinery or equipment that is manufactured and incorporates an advanced motor and drive system that has greater than one horsepower into a redesigned machine or equipment that did not previously make use of the system or was previously used and placed back into service in 2014 or 2015 that upgrades the existing machine or equipment with such system. Directs the Secretary to establish a rebate program for expenditures made by owners of industrial or manufacturing facilities, commercial buildings, and multifamily residential buildings for the purchase and installation of new energy efficient transformers. Terminates the program on December 31, 2015. Directs the Secretary to issue guidance for federal agencies to employ advanced tools promoting energy efficiency and energy savings through the use of information and communications technologies. Authorizes the Administrator of the General Services Administration (GSA), for any building project for which congressional approval has been received and the design has been substantially completed, but the construction of which has not begun, to use appropriated funds to update the building's design to meet energy efficiency and other standards for new federal buildings. Requires the Administrator for the Office of E-Government and Information Technology within the Office of Management and Budget (OMB) to develop and publish a goal for the total amount of planned energy and cost savings and increased productivity by the government through the consolidation of federal data centers during the next five years. TDV - Time Dependent Valuation - Measures savings from energy efficiency standards at times of peak. 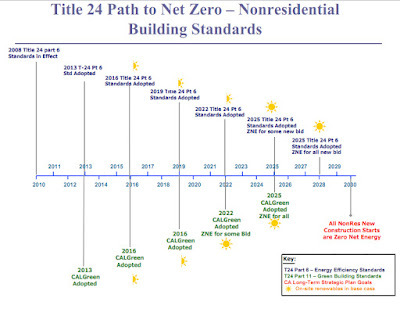 Title 24 –Part 6 is the California Energy Code - The Standards contain energy efficiency and indoor air quality requirements for newly constructed buildings, additions to existing buildings, alterations to existing buildings and in the case of nonresidential buildings, repairs to existing buildings. Cost effective with a 7 year payback - The 1974 Warren Alquist act created the Energy Commission in and gave authority to develop and maintain Energy Efficiency Standards. The legislation requires that the Standards be cost effective when taken in their entirety and amortized over the economic life of the structure and that the Energy Commission periodically update the Standards and develop manuals to support the Standards (about every 3 years). Ducts - Duct Insulation R6 or R8 - Duct Ceiling & Testing Reqd. ZNE - Zero Net Energy - A popular term to describe a buildings use with zero net energy consumption and zero carbon emissions annually. The amount of energy provided by on-site renewable energy sources is equal to the amount of energy used by the building. A ZNE building may also consider embodied energy – the quantity of energy required to manufacture and supply to the point of use, the materials utilized for its building. Zero energy buildings can be used autonomously from the energy grid supply – energy can be harvested on-site usually in combination with energy producing technologies like Solar and Wind while reducing the overall use of energy with extremely efficient HVAC and Lighting technologies. 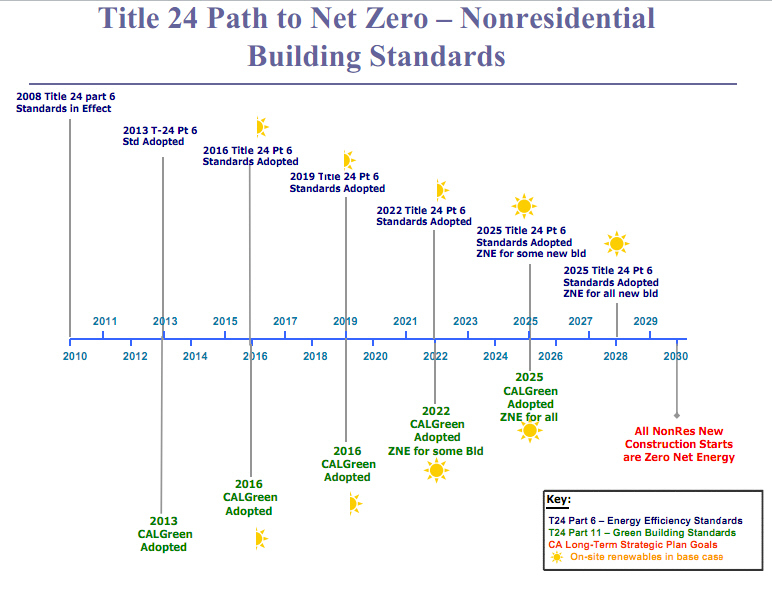 California has a ZNE goal for new homes by 2020 and commercial buildings by 2030. The ZNE goal means that new buildings must use a combination of improved efficiency and distributed renewable generation to meet 100 percent of their annual energy need. How is energy valued for trade-offs between different sources (natural gas, propane and electricity) and trade-offs with on-site renewable generation? Site, source, TDV? What energy consumption is included? Building operation, T-24 regulated only, embedded, transportation energy etc.? What is on-site renewable energy PV, hydro, fuel cells, biomass, landfill gas? What is on-site? Building site, development site, utility grid etc? How does definition or policy address sites that do not have access to renewable energy? According to the U.S. Department of Energy (DOE), the nation’s buildings account for more than 70 percent of total U.S. electricity use and roughly 40 percent of the nation’s total energy bill at a cost of $400 billion dollars per year. With 20 percent or more of this energy wasted, comparable reductions in energy could save an estimated $80 billion annually. Whole house fans to cool homes and attics with evening air reducing the need for air conditioning load. High performance windows, sensors and controls that allow buildings to use "daylighting"
Cool roof technologies Lighter colored roofing material re ects more of the sun’s heat energy away from the building. This reduces a bulding’s electricity bill by decreasing the amount of air conditioning required. Cleaner Environment - A reduction in pollution associated with the burning of fossil fuels in the home or in power plants. Improved Reliability - Increased utility system reliability are also important benefits from the adoption of energy codes. For each year of construction activity (in both newly constructed buildings and alterations to existing buildings) the new Title 24 2008 standards are estimated to reduce the growth in electricity by 561.2 GWh and to reduce the growth in peak demand by 131.8 MW. In addition, natural gas use is expected to be reduced by 19.0 million therms. The savings will accumulate as the Standards affect each subsequent year of construction. Challenges to LEED - A new coalition, the American High-Performance Buildings Coalition, is challenging the LEED rating system as the dominant standard for buildings. The coalition includes about 20 building industry trade organizations from the Adhesive and Sealant Council (ASC) to the Vinyl Siding Institute (VSI). The group is lobbying the U.S. General Services Association (GSA), which requires the LEED standard for all federal buildings, to reconsider, opting instead to require the Green Globes standard They point to a March 2012 GSA study that shows that Green Globes aligns with more of the federal sustainability requirements than any other green building rating system for new construction – including LEED. Green Globes aligns at some level with more of the Federal requirements (25) than any other new construction system in the GSA review. The Green Globes system does not include two of the Federal requirements (benchmarking and building system controls). LEED aligns at some level with 20 Federal requirements. The LEED system does not include seven of the Federal requirements (integrated design,process water, benchmarking, moisture control, acoustics, building system controls and greenhouse gas emissions). Green Globes CIEB aligns at some level with 22 Federal requirements. The Green Globes CIEB system does not include six of the Federal requirements (commissioning, recycled content, biobased content, low emitting materials, siting, and building system controls). LEED EBO&M aligns at some level with more of the Federal requirements (27) than any other existing building system in the GSA review. The LEED EBO&M system does not include one of the Federal requirements (greenhouse gas emissions). Green Globes and Living Building Challenge use on-site auditors to augment the certification information received electronically, while LEED bases its certification solely on the information submitted electronically. LEED has an established piloting process that is implemented prior to a revision to the certification system being released. LEED requires that new construction projects submit measured energy and water performance to the USGBC for five years following certification. The Living Building Challenge is designed to incorporate the results of at least the first year of a building’s operations prior to certification, which means this system has the greatest emphasis on measured performance. The chemical and plastics industries object to LEED’s proposed fourth-generation standard, known as LEED v4, which originally allowed buildings to score points for avoiding certain chemicals of concern, such as polyvinyl chloride, or PVC. The chemical-plastics industry coalition complained that these are “arbitrary chemical restrictions” and claims that LEED is “becoming a tool to punish chemical companies.” But the draft has since been changed, to provide only credit for using "good" materials, not avoiding "bad" ones. Still, the chemical and plastics industries still seem to find this threatening. The industry group also claims that LEED v4 is not “science-based” and does not use a “true consensus approach” to development. Among the industries’ concerns is a proposed credit that applies to the construction of schools, stores, and data centers, among others. It is meant to encourage the use of materials that disclose chemical ingredients and encourage builders to use products that don’t exceed a certain level of lead, mercury, hexavalent chromium, carcinogens, polyvinyl chloride and other toxic substances. Measurement Equity - Home Performance measures Energy per Square Foot. A measure of energy use per resident would be more equitable. An energy efficient 4000 sqft mini-mansion with no one home can have a better score than an unimproved 1500 home with a family of four even though the later uses much less energy per person. Modeled vs. Actual Performance - The gap between designed (aka modeled) and actual building performance is one of the most important issues in green buildings and by extension the push to improve the energy efficiency of our economy. LEED "Box Ticking" - When it comes to energy efficiency, it is often the letter of the law is often used more than the spirit of the law. In LEED projects a comprehensive energy efficiency strategy built into the overall design and construction of a building could be “dumbed down” into a series of tag on efforts. While some energy efficient measures might be taken, they aren’t necessarily ones that are strategically important in making a big dent in overall energy consumption. It becomes a box-ticking exercise more than a serious attempt to curtail energy use—changing the lightbulbs when you could transform the building. The sad truth is that many green buildings today are neither highly efficient nor particularly intelligent, and this is a missed opportunity. We have the potential to deliver green intelligent buildings that are sustainable as well as able to deliver high-performance, low-energy usage. A green intelligent building “not only has a bike rack, green roof and waterless urinals, but also the systems, controls and automation needed to provide improved scheduling, coordination, optimization and usability. Commercial Focus - Programs like LEED are geared more for commercial construction versus residential. Poor Quality Insulation - Title24 derates insulation performance by 30% (that is R30 is treated as R20) because in practice so many insulation installations are done wrong. The insulation installer is usually the lowest paid constration worker with the least training and often poor working conditions and is often working on a piece rate. Often, insulation building inspection is not required by building departments. QII, Quality Insulation Inspection, requires a third party HERS inspection. Lack of Context - A project can earn a high rating and be located in a hard-to-reach place or built on former open space. energy savings potential is very high. Recommended Timeline: While work should begin as soon as possible, this is a complex issue and is therefore a long-term effort: 5+ years. Thermal energy is a grossly underutilized resource in the United States relative to other developed countries. The development of an American National Standard for heat metering, led by ASTM International with cooperation from IAPMO, is currently underway. This standard will address a major gap in standardization, allowing for thermal technologies to be more easily utilized in residential and commercial buildings. Consensus standards for heat metering and hot water solar thermal systems need to be completed to advance the use of thermal technologies for water heating applications. This represents a significant and very achievable advancement in energy efficiency. Recommended Timeline: This work should be conducted in the mid-term: 2-5 years. There is considerable pressure to further increase the water savings by requiring decreased flows and flush volumes. It has been shown that further reduction in water use can be achieved through more efficient plumbing component design. Nevertheless, there is little research available today that evaluates the impact of those designs on the plumbing system’s overall performance due to reduced flows in the system, and especially the drainage system. There are research projects underway in the U.S., notably the Plumbing Efficiency Research Coalition, that will help to determine “how low we can go” without negatively impacting public health and safety. 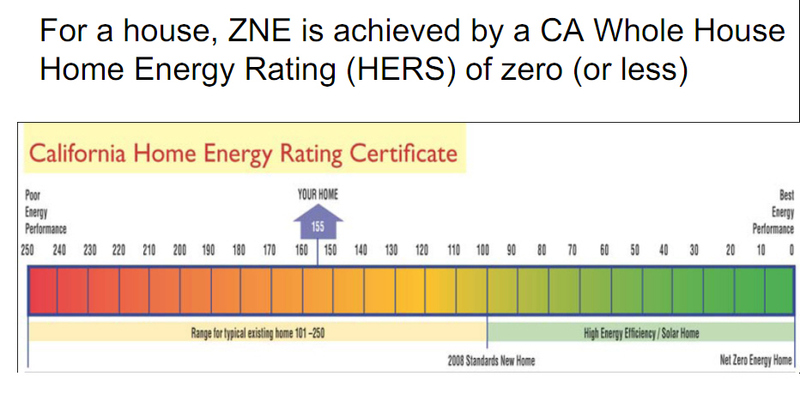 California Energy Commission - Title 24 Energy Efficiency Standards - The CEC’s web site provides access to the 2005 manuals, compliance forms and new outdoor lighting zones. The 2008 Standards which come into effect on August 1, 2009, are also available here. 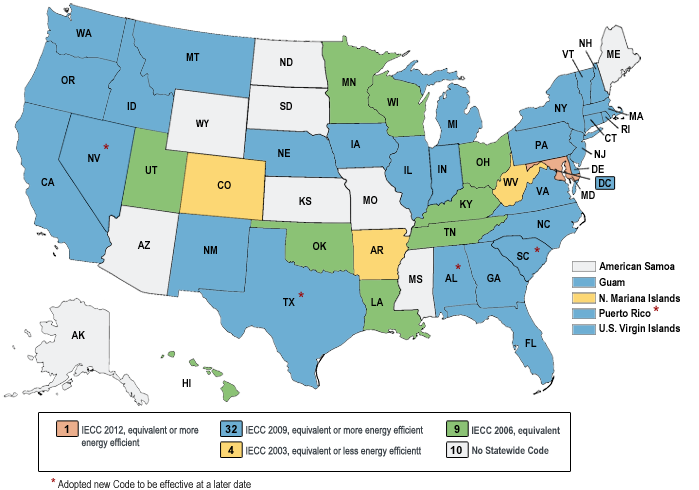 DOE – Building Energy Codes – An information resource on national model energy codes. DOE works with other government agencies, state and local jurisdictions, national code organizations, and industry to promote stronger building energy codes and helps states adopt, implement, and enforce those codes. Davis Energy Group - Provider for the U.S. Green Building Council’s LEED for Homes program for California and Nevada. Building Science - provides objective, high-quality information about buildings. This resource combines building physics, systems design concepts, and an awareness of sustainability to promote the design and construction of buildings that are more durable, healthier, more sustainable and more economical than most buildings built today. Hi Mark, it's great to see you're promoting energy codes! They really are one of the best policies for significantly reducing energy use in buildings. I think you found some maps that are a bit outdated, though. The Building Codes Assistance Project (BCAP) has been tracking state and local energy code adoption for many years. You can find our most up-to-date maps and lots of other energy code resources and tools on our best practice network, the Online Code Environment and Advocacy Network (OCEAN): www.bcap-ocean.org. Check it out! I found the blog very informative. Thanks! The concept of building energy codes is a boon to all the builders. With the implementation of this system in any building project, it becomes easy for builders to build any design with a greater efficiency or implement the sustainability of the building. Now days, many architects and builders are implementing the concept of building energy codes in their construction projects which is one of the most easiest and cost effective ways for building contractors. One of the recognized company, named as, The Spinnaker Group Inc, is providing a full support of USGBC core purpose to transform the way the buildings and communities are designed as well as they are also providing green building commissioning to architectures, developers, contractors and engineering firms. I discussed the issue online recently and using lots and lots of batteries really is the best solution with today's mature technologies. thanks for sharing such an nice blog. are the bulk sellers of branded and genuine substances. The materials may include white cement and putty, RMC, steel, bricks and much more. Good information, great blog, looking forward to read more such useful information with your blog, Keep Sharing. I though you will also be interested in best Energy Advisor for you.